Published on February 13, 2018 in general info. 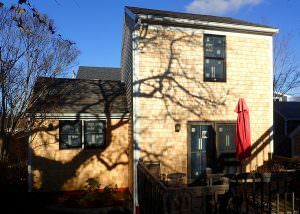 Closed Tags: Cape Cod Luxury condo sales, Cape cod real estate sales, Provincetown condominiums, Provincetown condos, Provincetown luxury homes, Provincetown new construction, Provincetown real estate. 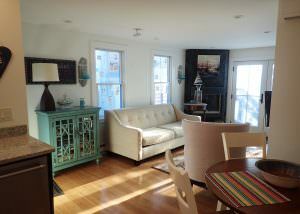 3 Race Road #D is a two bedroom two bath stand alone condo in the West End. It has 838 square feet. We are launching this property this week with a listing price of $789K. MLS REMARKS: New windows, and new shingles on this two bedroom two bath freestanding condominium in the West End. Beautifully furnished and ready for the 2018 season. Thoughtfully designed throughout, this two level cottage packs a lot in the square footage with a great use of space. The first floor has an open floor plan with a well sized living room with a gas fireplace. 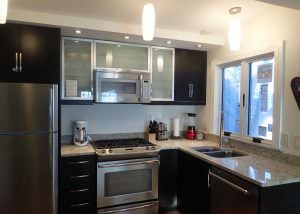 There is a granite and stainless kitchen with a dining alcove. 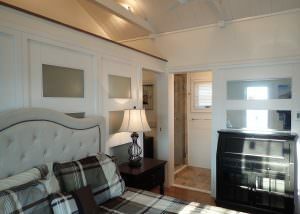 The charming guest bedroom has vaulted ceilings and plenty of closet space. The custom full bath has unique stone work, including travertine and river rock. The laundry center is on this floor. The second floor master bedroom suite has vaulted ceilings, a water closet and stone and marble shower with heated flooring. There are many design details like mahogany doors and frosted sliding glass panels.The large exclusive use deck extends the living area and is great for outdoor entertaining. There is one parking space and weekly rentals are permitted.